The critically acclaimed and gloriously glamorous musical Crazy For You is coming to Glasgow’s King’s Theatre in October 2017. Book your tickets now! 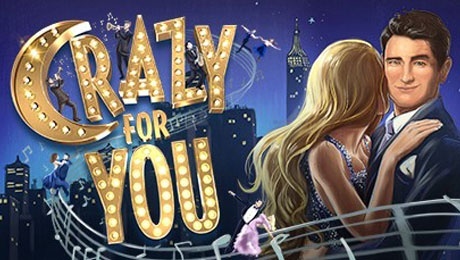 High energy and high kicking, Crazy for You is the ultimate feel-good musical starring Tom Chambers (Top Hat and winner of Strictly Come Dancing) featuring a fabulous score from the Gershwin brothers’ songbook. This Gershwin extravaganza is a high energy comedy which includes mistaken identity, plot twists, fabulous dance numbers and classic Gershwin music. Memorable Gershwin tunes include amongst others I Can’t Be Bothered Now, I Got Rhythm, Nice Work If You Can Get It, Embraceable You and Someone To Watch Over Me. This multi award-winning, romantic comedy is filled with some great dance numbers. The story charts the troubled love story of Bobby, son of a wealthy New York banking family and frustrated Broadway hoofer, and Polly, daughter of the proprietor of a failing theatre in Deadrock, Nevada. Sent to close the theatre down, Bobby falls for Polly and, in the guise of a Hungarian impresario, decides to save the theatre by putting on a show. So book now to join the cowboys and showgirls for a wonderful evening full of song, dance and hilarious dialogue which promises to have you toe-tapping along with them!